Don’t want a Private Tour? Are Bus Tours too large for spending quality time in beautiful Yosemite National Park? Join our Semi Private Tour where you would join one or two more couples. We guarantee no more than 8 people on this Tour. This tour will offer you personal service with a warm gathering of travelers. Our Semi Private Tours are designed for couples celebrating their anniversary, a birthday or a special event. Take your Mother out for a wonderful outing and treat yourselves to a memorable Yosemite getaway! Smaller tours are also recommended for visiting the secret gems of Yosemite. Includes the option to hike the breathtaking 4 Mile Trail from Glacier Point. Fresno/Madera/Merced to Yosemite Semi Private Tour – $475/Couple, $425/Senior Couple over 60. Lunch, water, snacks, entrance fees, and gratuities are included. Maximum of 8 guests on the Tour. 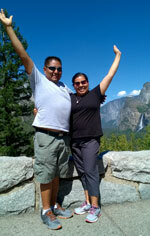 Oakhurst/Mariposa to Yosemite Semi Private Tour – $425/Couple, $375/Senior Couple over 60. Lunch, water, snacks, entrance fees, and gratuities are included. Maximum of 8 guests on the Tour. 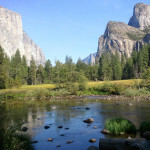 Fish Camp / Redwoods in Wawona and Yosemite West to Yosemite Semi Private Tour – $400/Couple, $330/Senior Couple over 60. Lunch, water, snacks, entrance fees, and gratuities are included. Maximum of 8 guests on the Tour. 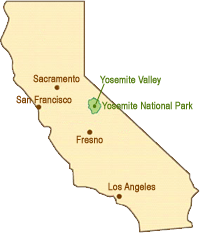 We leave early from Fresno/Oakhurst where we enter Yosemite National Park at the South Entrance. We stop at Chinquapin, and then on to Glacier Point (where most tour companies do not and cannot visit due to commercial vehicle size restrictions). Glacier Point is an overlook with a commanding view of Yosemite Valley, Half Dome, Yosemite Falls, and the Yosemite High Country. This viewpoint is accessible by smaller vehicles from approximately late May through October of November. The short walk to Glacier Point will reward you with a breathtaking view of both Yosemite Valley and the mountain tops. W e continue to drive back to Chinquapin and down to Yosemite Valley where we travel through Wawona Tunnel, to Tunnel View, where we can see Bridalveil Falls, El Capitan, and Half Dome. In Yosemite Valley, we visit Bridalveil Falls, El Capitan, Yosemite Chapel, Sentinel Bridge, Half Dome, and Yosemite Falls. We take a break here for lunch and walk to the base of Yosemite Falls. There are gift shops located here for purchasing souvenirs. Upon resuming, we visit the meadows in front of El Capitan to see if anyone is rock climbing. From there we drive along side of the Merced River and look at the place where President Theodore Roosevelt and John Muir camped in May, 1903. 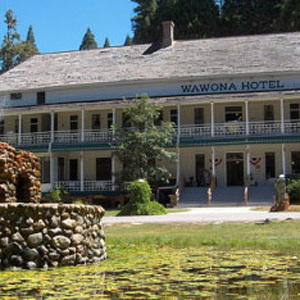 On our way back we stop at the Pioneer Village History Center and also the historical landmark Wawona Hotel where you can view young Sequoia trees of the Park. The Pioneer Yosemite History Center consists of historic structures from different eras of Yosemite history. Originally constructed in different locations throughout Yosemite, they were moved to Wawona in the 1950s and 1960s. Each building represents a different chapter in the Yosemite story. Allow Yosemite history to come to life as you travel back in time to an era of horse-drawn wagons, covered bridges, and log cabins. 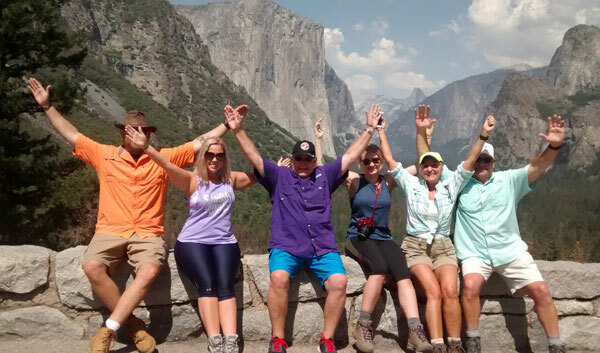 In this tour people will see more of Yosemite National Park in one day than most other tours of Yosemite. Lunch, water, snacks, entrance fees, and gratuities are included. Disclaimer: Sometimes due to scheduling issues, the hiking portion may be changed to go in the uphill direction.